Steve Albers received his BSc in Physics from the State Univ. of New York at Albany (1978), and MS (1986) in Atmospheric Science from the University of Oklahoma. Between 1976 and 1977 he worked as part of the Viking Intern program connected with the Jet Propulsion Laboratory and Brown University. He did some image processing of Viking Mars Lander Images at JPL's Image Processing Laboratory as part of the Viking Lander Imaging Team. He also performed some data reduction for the Meteorology Team. During the summers from 1980-1985 Steve worked as a Field Meteorologist for the North Dakota Cloud Modification Project. He directed hail suppression and rain enhancement cloud seeding with fleet of six aircraft utilizing ice nucleation seeding materials and operated an Enterprise WR-100 5cm weather radar. Between 1983 and 1985 he worked as a Research Assistant at the School of Meteorology, University of Oklahoma. His research topic was the development of a statistical severe weather forecast package. He served as a Teaching Assistant for Meteorological Measurements and did some storm chasing. 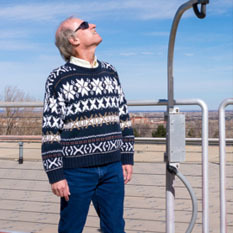 Since 1986 Steve has worked at various NOAA facilities in Boulder, CO , including the PROFS program, Forecast Systems Laboratory, and the Earth System Research Laboratory. In this context he came on-board CIRA in 1989. His work includes extensive development and implementation of meteorological analyses of wind, clouds, temperature, and microphysical variables for the Local Analysis and Prediction System. A variety of remotely sensed and in-situ data are ingested, quality controlled, and merged in the analyses. The analyses are used for initializing NWP models and are displayed on workstations for nowcasting, and they are fielded at ESRL, other government agencies as well as private companies. 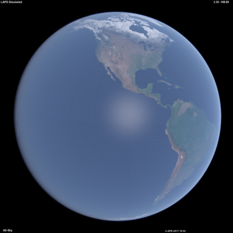 He has worked on satellite image processing algorithms, including photometric correction that depends on viewing geometry, as well as image processing to produce global planetary, meteorological, and geophysical maps using IDL and other display software for NOAA's Science On A Sphere TM (SOS). Steve gives SOS presentations and daily weather briefings. He's participated in meteorological workstation and World Wide Web display software. Radar experience includes development of radar Doppler velocity de-aliasing algorithm, testing and evaluation of algorithms to be run on the Next Generation Weather Radar (NEXRAD), and radar data interfacing for the Regional Radar Volume Project. Steve takes on some CIRA supervisory duties as well.